The Woolf’s resident scientist, Iida Ruishalme, approaches happiness from diverse angles, looking at how her ideas may have adapted to her circumstances over the years. For the bigger part of my life I accepted the idea that the most important goal in life was to be happy. The happiness-concept neatly encompasses everything else, doesn’t it? Perhaps it does not say anything about money, fame, or success, but those kinds of things can all be had without any happiness involved. Money and success may have their appeal and, depending on the circumstances, may contribute to our feelings of satisfaction—but it seems that those goals alone aren’t sufficient, they aren’t the vital intrinsic stuff that a good and fulfilled life is made of. Happiness still triumphs. Perhaps it’s no wonder that I thought more about my perspective on life goals after having children. Isn’t it natural that a good parent wishes simply for their children to grow up to be happy? I believe I have uttered that phrase myself. So, for a change of perspective, I wondered how satisfied my own mother should feel in that regard. Could she feel reassured that the life she has nurtured into adulthood has landed safely in the realms of happiness? Am I happy? I tend to experience a rather wide array of emotions. I’m prone to sadness, apathy, enthusiasm, frustration, merriness and so on and, like it or not, I engage in all my emotions with gusto. This variety has by no means been dampened by having two little children (in a foreign country far from the support of extended family). A lot of the time it’s been hard. In fact, there is research to support that having children will not make parents any happier. On the contrary. Daniel Gilbert, a psychology professor at Harvard made a chart that summarised results from four studies on the effect children have on marital happiness (quite closely aligned with general happiness) in his book Stumbling on Happiness. His chart was presented in its below form with the more appropriate title: The Most Terrifying Chart Imaginable for New Parents in a TED-talk, Let’s talk parenting taboos, by Rufus Griscom and Alisa Volkman, a couple who run a parenting website, babble. 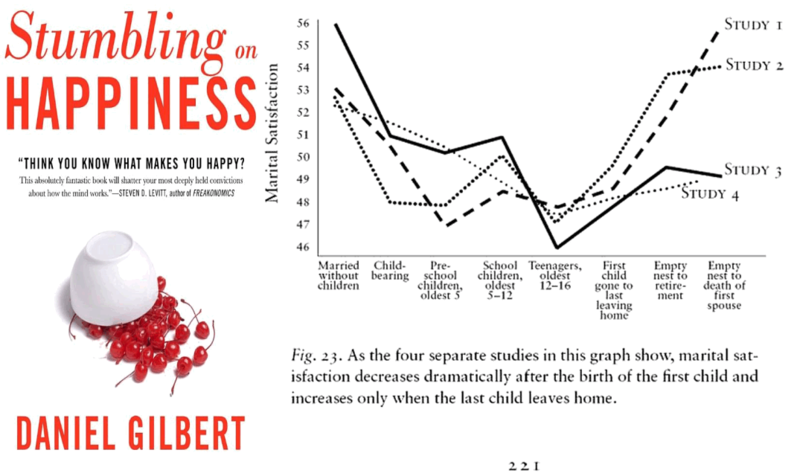 Gilbert’s book, Stumbling on Happiness, and the now infamous graph otherwise known as ‘The most terrifying graph imaginable for new parents’. Image original source unknown. Griscom and Volkman argue that the most dramatic change brought by children is not the shift in the average happiness, but that the satisfaction curve turns into a roller coaster, surpassing even the variety of adolescence. This does somewhat match many people’s experiences on the topic, including mine. Before children, life had boring moments. Now I don’t really remember what that felt like. Being a parent lowers your average daily happiness. But average daily happiness isn’t all there is to be said about happiness. Indeed one could make the case that average happiness across a day isn’t what we’re trying for. As human beings, it’s not our aim. It shouldn’t be our goal. What we should be looking for is special transcendent moments that may even come at the cost of a lower average. Ahaa! It’s the amount of transcendent moments that matter then, not happiness per se. Perhaps a life is a full and a good one if there are enough transcendent moments present. far better or greater than what is usual. Huh. This still leaves me wondering. As nice as it is to have extraordinary, special moments—and I would much prefer a life with them to one without—I don’t know if I would use their frequency as a primary means of determining the make-up of the best kind of life. Do I want my children to grow up to have lives with as many transcendent moments as possible? Or should I still go back to the happiness factor? And if happiness is the most important angle, would I want them to feel as much happiness as possible? Or is there such a thing as enough happiness, or too much? I get the feeling that something is missing in this line of thinking. To get to the bottom of that, I tried to see if I could imagine scenarios with as much transcendence or happiness as possible, but which I would actually not wish on myself or my children. I can imagine a kind of madness for instance, marked by a profound disconnect from reality, painfully apparent to everyone else but the person themselves. That person could still be experiencing a state of, say, perpetual transcendental bliss, without knowing anything of the outside world. Not a bad place to be, perhaps, but not my preferred one. Or how about a less extreme but more chilling kind of a prospect—let’s imagine a sociopath, a person wholly incapable of empathy. They could commit atrocious acts and still be perfectly happy. Not an impossible scenario at all, and a terrible one at that. Moving away from the extremes of mental illness, I would still argue that happiness as a goal has serious shortcomings. Let’s say that a cultural minority would become cruelly and permanently oppressed in our society—would I wish for me and the people I care about to simply continue being happy? Clearly there are other important factors to consider. We do not exist in a vacuum, after all. Our lives play out in a close relation to the world around us. It’s not only about how we feel, but what we do, and how that relates to others. By the measures that you used to determine your happiness before you had children, you’re completely miserable. That’s probably why so many people are so scared of it—because they don’t have access to another paradigm. But as soon as you have your children, those first moments of holding your child, your whole sense of what’s important to you changes, of what your place is in the world. This comment seems to bring in something to the discussion that falls outside of happiness, this sense of what is important, and it’s definitely something I want my life to have—meaning. I wish for my children to lead lives that will feel meaningful to them. But this is still something that is inside our heads—it’s just a feeling. Is the important stuff in life all about feelings? What about the people who struggle with life and can’t boast a particular aptitude on the merry feelings agenda? Firstly, psychology studies have shown support for the adaptation level theory which is the idea that even drastic life changes—ending up in a wheelchair or winning the lottery—merely shake our level of happiness temporarily, and we end back up our personal ‘normal’ level of happiness, calibrated to match our circumstances. … a growing body of evidence that factors like genes and age may impact our general well-being more than our best day-to-day attempts at joy. In one study, researchers at the University of Edinburgh suggest that genes account for about 50% of the variation in people’s levels of happiness—the underlying determinant being genetically determined personality traits, like “being sociable, active, stable, hardworking and conscientious,” says co-author Timothy Bates. What’s more, says Bates, these happiness traits generally come as a package, so that if you have one you’re likely to have them all. Should the mothers of people who do not have this ‘ happiness package’, and don’t naturally overflow with joy, feel disappointed? “Maslow’s Hierarchy Of Needs” by FireflySixtySeven. 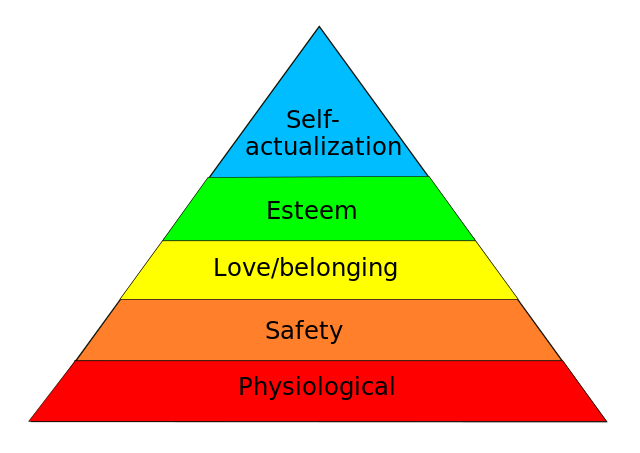 Own work using Inkscape, based on Maslow’s paper, A Theory of Human Motivation. Licensed under CC BY-SA 4.0 via Wikimedia Commons. I would not like to give the idea to a melancholy child that her life was somehow worse than that of a more carefree sibling. I do wish that my children will experience a wide range of emotions; enough happiness not to despair; enough empathy to be sad about the suffering of others; and a feeling of agency to enable them to make their own personal mark on the world. No one state of being has the decisive importance over others. Some happiness, like good food and a solid roof over your head, sure are good things to have, and can make living a lot easier – happiness as a need, perhaps falling somewhere along “love and belonging” and “self-esteem” in Maslow’s pyramidal hierarchy. But like with money: having more is great, but having a lot falls short of being a primary goal. Life is neither about a static state of having nor being. Life is doing. What is it that I put above happiness? Learning. Caring. Understanding. Creating. Growing. Doing those things, I may not always be happy. Sometimes I may be downright miserable. Hopefully I will feel that I’m doing something I want to do—at the very least, figuring out what it is that I want to do. I will seek until I have a sense of purpose. It’s more important for me to be happy about what I am doing than to chase some hard-to-define degree of being happy for another hard-to-define (sufficient?) portion of my time. Certainly it’s a worthy to goal to find enjoyment in life, and the searching as well as the finding will occasionally cause me (and others) moments of happiness. But that’s all those are—moments among others. The more crucial goal, as I see it, is instilling in yourself and others that wish to keep on searching and having those moments, transcendent or not. Apart from all the things that go on in our heads, there must be an intrinsic value in how we relate to this world. I don’t want my children to live in a bubble, no matter how happy a bubble it may be. I want them to care for that what’s around them in some form—humans or animals; philosophy or construction; nature or culture—some aspect of this universe. I want them to want to engage with the world, preferably engaging and challenging themselves in the process. None of us are ever finished. We are always on the verge of becoming someone slightly new. Becoming what we can be—what we want to be—not ceasing to change, now that is a worthy goal. Whether my children wish to engage in the world through learning something, helping others, expressing themselves, or developing new ways of seeing beauty in the universe—engagement and drive, more than just happiness, help make living mean something. Happiness is a bit like confetti. It’s something nice and colourful to go with the moments when we enjoy the results of our engagement, our participation in something that is worthwhile. But even if there is no festival of happiness along the way or even at the end of a task, doing will carry a sense of accomplishment that has meaning. It will keep me going. Happiness is secondary. It’s doing, changing, developing, taking part, that makes all the difference. … because being useful to others instills a sense of being needed and valued. I could manage to get through a lot more misery, knowing that I am needed and valued. So I’ve changed my mind about happiness as a life goal. Being happy in life is not as important as being happy about life, and even that is not as important as the will to do something about if and when I—or others—are decidedly unhappy. I’ll trade happiness for doing something I believe in. I think I can live with the secondary happiness of that choice. Iida Ruishalme is a cell biologist, a science communicator, and a fiction writer. She is also a contributor to Genetic Literacy Project and Skepti-Forum. She blogs at thoughtscapism.com.